Irish composer Patrick Cassidy has been nominated for the Discovery of the Year Award in the 14th World Soundtrack Academy programme. This prestigious accolade will be announced and presented during the World Soundtrack Awards and Concert on October 25th at the Kuipke Events Centre in Ghent, Belgium. The World Soundtrack Academy’s objective is to reward and stimulate the growth of talented composers by awarding the Discovery of the Year and Patrick Cassidy’s musical score for John Michael McDonagh’s film ‘Calvary’ will face competition from Oscar winner Steven Price (‘Gravity’, ‘The Worlds End’) and Daniel Pemberton (‘The Councillor’, ‘Cuban Fury’). 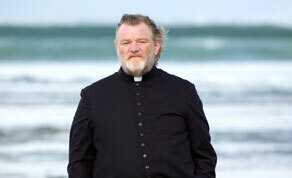 Set in Sligo, Ireland, Calvary is a blackly comic drama about a good priest who is continually shocked and saddened by the spiteful and confrontational inhabitants of his small country town. When his life is threatened by a parishioner during confession he begins to wonder if he will have the courage to face his own personal Calvary. Cassidy’s widely acclaimed score - recorded by the RTÉ Concert Orchestra - captures this overpowering tragedy. With alternately hopeful and elegiac themes and penance conveyed with sombre, psalm like melody, the spiritual tone portrays the plight of a man asking forgiveness for his church’s transgressions. Speaking of his collaboration with Calvary director John Michael McDonagh, Patrick said: John did not want the score to sound ethnic because, although the film is set in Ireland, the story is universal. I did however use quite a lot of voices which I felt would convey tenderness and a sense of spiritual goodness. He continued: I am very pleased that the World Soundtrack Awards has nominated Calvary in the Discovery of the Year Category. Calvary has had great success and did very well at the IFTAs earlier this year; let’s hope that the winning streak continues.